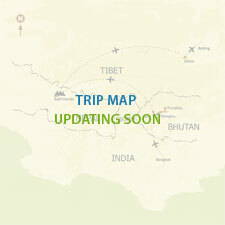 Nepal overland tour is one of the best ways to explore the culture, tradition, religion and bio-diversity of Nepal. Through this tour, the tourists visit the main old temples, Monasteries, Stupa and Durbar Squares (Royal Palaces) in and around the Kathmandu Valley. Some touristic places that are naturallly beautiful are included in the overlad tour package. In addition, this tour presents the traditional cities in Kathmandu Valley, mostly inhabited by the Newar people. -Visit 'Seto Machhendranath', 'Bangemudha' and 'Toothache log'. People believe they can cure toothache by nailing a coin to the log. Then drive to Swyambhunath . It is a renounce Buddhist stupa on the top of the hill. Both are listed in the world heritage site by the UNESCO. Day 03: Breakfast- visit 'Pashupatinath' Hindu Temple.Drive to 'Sankhu', a small Newari traditional town. A short walk to 'Bajra Jogini' temple, the tantric goddess. Visit Bhaktapur Durbar Square ( Royal Palace ) and the amazing temples of Bhaktpur. This city also listed in the Worlds Heritage Site by the UNESCO. The pottery square , Nyatpola temple and temple of the Dattatraya are the major attraction of the Bhaktpur city.After sightseeing in Bhaktapur, drive to Pokhara a tourist hub in Nepal and full of natural beauties.Pokhara is the city of lakes,water falls,gorge,caves and beautiful views of Himalayas. Day 05: In the morning drive to Sarangkot for sunrise and Himalayas view. Then drive back to hotel and breakfast .Whole day sightseeing and boating in phewa lake. Day 06: Drive to Chitwan National Park.Lunch is served.At evening Tharu village tour,tour to elephant stable and sunset view. Day 07: Full day activities in Chitwan National park . Jungle walk,Elephant ride,canoeing,visit elephant breeding center and at evening tharu stick dance. Day 08:In the morning bird watching and breakfast.After breakfast drive back to Kathmandu.and at evening fare well dinner with cultural program. Day 09: Drive to International airport and fly back onward destination.